The toy chopper is easy to identify as Barbie dolls with a bright pink and blue body and silvery accents! Two seats with seat belts let friends fly together to share the experience! Inspired by Barbie Dream house Adventures, fans can peek into the everyday life of Barbie as she embarks on exciting adventures with her family and friends or make up their own stories as they explore the world! 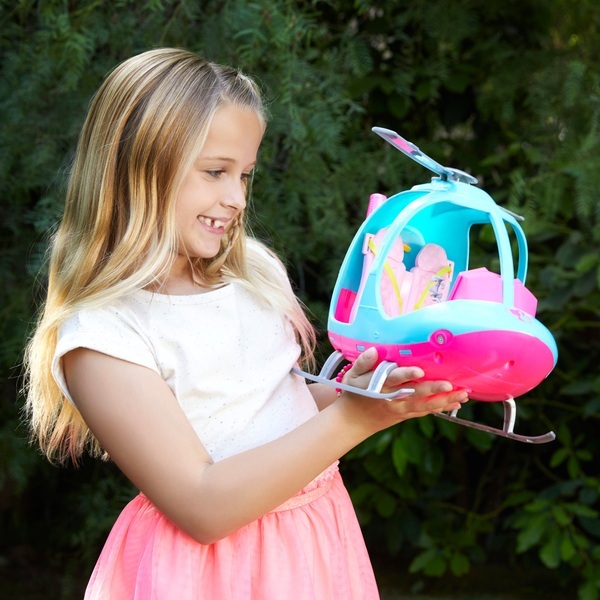 The Barbie helicopter inspires imaginations to take off and explore the world during playtime! The rotors really spin, just push to start a new adventure! The Barbie Travel Helicopter is great for encouraging kids imagination. Let imaginations hop into the Barbie Helicopter and take off to all parts of the world - this colourful chopper inspires stories to take flight. Designed in bright pink and blue, its silvery rotors spin with a push. Pick up and "fly" through the air to take in the sights below. Inside is room for two dolls (sold separately) - silvery "controls" let kids’ role-play piloting fun, and seat belts keep the passengers safe inside. Inspired by Barbie Dream house Adventures, fans can peek into the everyday life of Barbie as she embarks on exciting adventures with her family and friends or make up their own stories as they explore the world! Collect other Barbie travel dolls and toys to expand the playtime possibilities (each sold separately, subject to availability).